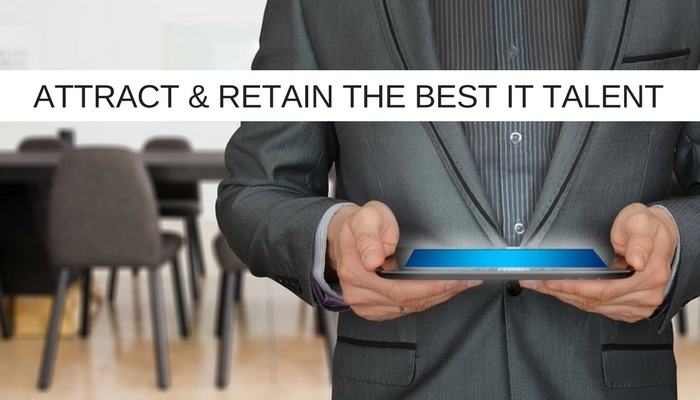 Businesses that are reliant on IT need to pay special attention to their recruitment and retention strategies in 2018 as a recent survey suggests that a third (32%) of IT professionals hope to switch jobs within the next 12 months. Given that just about every business is now reliant on IT for delivery of its core business offer – this probably means YOU. The survey, carried out by Spiceworks, backs up what I’m hearing. IT professionals are happy with the industry and, generally, they are happy with their employer but they would be tempted by a better offer. It’s worth just pausing to digest that headline claim … a third of IT professionals are planning to either begin looking for or switch to a new IT job in 2018. A third! Take a second to consider your amazing business plans for this year, reflect upon the role that IT will play in delivering those plans. Now, look around your IT office and imagine the impact of a third of your key IT talent handing in their notice. So how do you attract and retain the best talent? Three quarters (75%) hope for a pay rise – over half (51%) EXPECT one, 70% want to learn new skills and 39% says they are more attracted towards companies that consider IT a higher priority. So, if IT is central to your business strategy and growth, you offer great training and the best remuneration package, you may well be OK. Just so long as the firm down the road doesn’t up its game, trump you on these criteria, and steal your best players – a third of whom, remember, already have one eye on the door. I honestly think that the pay thing is a red herring, even if three quarters cite it as a reason for considering a move. A lot of talent mention money as a motivating factor for a move, but when you do the deep dive with them, most open up to deeper considerations. In fact, there is plenty of research that suggests that increases in income have little or no effect on life satisfaction levels, the University of Stirling tracked 18,000 adults over a nine-year period in the UK and Germany, asking annually about income level and how satisfied they were with life … bigger pay packets did little to improve the latter. As well as increasing the self-esteem of your existing employees, becoming famous as a great training employer may attract better new talent. Opportunities for self-improvement being a key feature many look for in a job search. I remember years back, a poster on the office wall of a firm I once interviewed with that said “We can not guarantee employment, but we can guarantee employability” – a commitment to training that made them a REALLY attractive proposition. So self-improvement, it turns out, is usually more important than a pay rise – but even this doesn’t tell the whole story. We often place talent in a new position where the training offer is not noticeably greater and where pay scales are comparable. Drill even deeper and talent increasingly is seeking to feel that they have made a difference at the end of their day. That third driver of career moves, cited by 39%, that talent is attracted towards companies that consider IT a higher priority could be the most important piece in the recruitment and retention jigsaw. It stands to reason, you spend an awful lot of time at work. You’re going to get more satisfaction out of your workday if you believe that your labours are integral to a greater plan .. that IT is an integral part of the bigger picture. We saw a pattern start to emerge about five years back, with talent migrating from businesses where IT was still a “keep the lights on” back office function to firms where IT was a strategic partner. I’d argue that, as most businesses now fall into the latter category, this migratory pattern has evolved. Perception is reality, in other words, IT is key to most businesses but those that acknowledge the strategic importance of IT are better placed to attract the best talent than employers who harness the strategic potential, but fail to fully give credit where credit is due. This could be the greatest lesson for all of us. Within many businesses, IT Project teams are leading innovation and actually creating new revenue streams and IT talent is being brought into strategic planning discussions earlier. Firms acting in this way are finding that they attract and retain the best IT talent, they are the proof that talent is attracted to employers where IT is given a higher priority. Of course, the trouble is that you can do all of this but if your competitor goes one better, for instance, gives IT leaders a seat with the C-suite, then they become a shinier proposition. The status quo doesn’t long. Just as with the best pay and the best training, prioritising IT may not give you immunity against an increasingly fluid workforce. Your best bet is to accept that IT talent will move on and prepare yourself. That preparation should address the short-term, immediate capability gap that is caused when your star player advises you of their intention to leave AND the mid to long-term needs of your business. Short term you should definitely broker an arrangement with a provider of talent ‘as a Service’. This will allow you to patch in necessary talent to maintain delivery standards. Mid to long term you should have a trusted specialist recruitment partner on speed dial – reach and speed are key when you need to access talent to fill strategic IT roles. As an employer you want a partner with excellent reach to quickly find the right candidates, you want bespoke adverts to find them in the first place! Peer selection, ongoing contact with a maintained database of previously interviewed candidates, candidates profiled by Subject Matter Experts to ensure the best fit, these are all vital tools that you need at your fingertips when looking to fill a key role. Having a partner who can quickly match the skills and personality of an individual with your company culture and their career goals with the opportunities offered by your business can make all the difference. Most of all, you need a partner who will sell yours as a great place to work.